Since the arrival of Jio Phone market, users have once again started attracting feature phones. There are many such features in this phone which are present in the smartphone. If you have bought a Jio phone then you will be well acquainted with its user interface yet. However, there are some hidden features in the phone which will not be easily visible to you. They have to search by going to the phone’s settings. 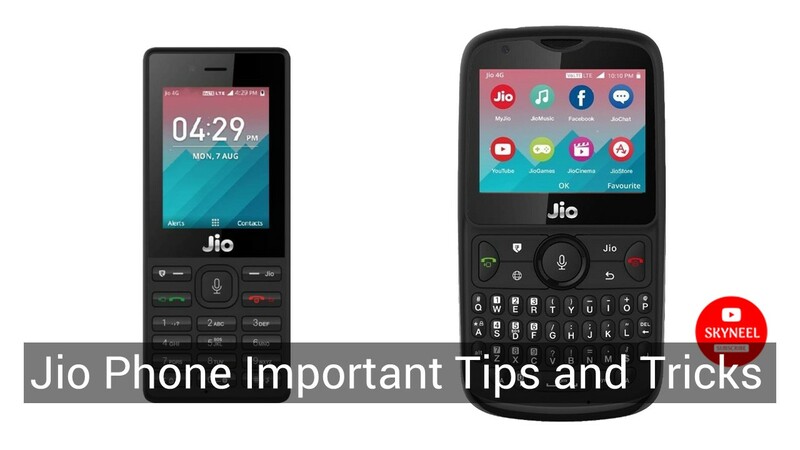 We are telling you Jio Phone tips and tricks in our news that will prove to be helpful for you. For this, to import contacts from your Google Account to Jio Phone, open the Contact app in the phone. Now go to the settings on the right hand side. Scroll down in the settings and select Import contacts. Here you will see the Gmail option, select it Now you will be asked for Gmail ID and password information. After giving the Gmail ID and password, you have to give access to KAI OS. Now whenever you open a contact account in the phone, you will see a Google contact. Keep in mind that the Gmail address does not sync as frequently as a smartphone in your live phone. Similarly, you can import contacts from Outlook contacts. For this, you have to select the Outlook option in the import contact. Now, you need to give your account id and password to sync the contact. If you want to use the Call Forwarding feature in your Jio Phone, go to the phone’s settings. Open the call settings in the Network and Connectivity tab in Settings. Now scroll down and go to call forwarding. Now select the option according to your need. Please tell that you will also have to give another number to forward this feature on which your call will be forwarded. Do you know that Jio Phone’s default web browser can track your online activity just like any other browser. In its official app, you will not be able to find the option to delete your history. To do this, go to Jio Phone settings and select the Privacy & Security tab. Here you will see the option of browsing privacy. From here you can delete your browsing history and stored data. Also, you will see the option of Do Not Track here so that you can stop tracking on a website or app. You can set a passcode lock in your live phone so that your phone can not be used anymore. For this, open the Settings app and go to Privacy & Security. Now select the screen lock. Turn it on to activate the screen lock in it. You will now be asked to select a new screen lock in the device. You have to give a four digit passcode and click on OK. Now the passcode is set in your phone. After this you will have to enter the passcode whenever you unlock the phone. To transfer files from a storage device to your live phone, you will need to make some changes in its settings. You will not be able to transfer from any file storage to the live phone because this option is turned off by default in the Jio Phone. For this you have to go to the storage in the phone’s settings. Select USB storage option here. Choose the option here. Now you will be able to transfer files using USB cable. The Jio Phone supports 22 languages. These include English, Hindi, Marathi, Bengali and other languages. To change the interface language, select the Personalization tab in the phone’s settings. Now you go to the language option and click OK. Then select the language of your choice. After selecting the language, the phone’s interface will be converted into the same language. Despite having a feature phone, some smart modern features have been included in the Jio Phone. However, some features in the phone do not work, including digital payments. If you want to know about the new software updates introduced in the phone, go to the settings app for it. Select the Device tab here. Now select Device Information and scroll down to LYF Software Update. Here you will find information about OTA updates. In this article, we told you about Jio Phone 7 Important Tips and Tricks. If you liked this article, you can also like our Facebook page and also subscribe to our YouTube channel. If you have any problems related to this article, you can tell us by commenting.